The ascent of Buttermere Red Pike from Buttermere is one of the classic fell walks, despite the rather difficult final scramble. The fell comes at the western end of the impressive ridge that dominates the southern side of the Buttermere valley, and to the west the landscape changes in character, with smooth grassy slopes replacing crags on Starling Dodd. The three fells on this ridge each follow a similar pattern. The entire southern slope, facing Ennerdale, is, long, uninterrupted, steep and relatively featureless. To the north each of the fells pushes a ridge north towards Buttermere, creating a series of coves. Red Pike is unusual in that it claims full ownership of Ling Comb, the western-most of these coves, while the cove to the east, containing Bleaberry Tarn, is shared with High Stile. Red Pike differs from High Stile and High Crag in that the northern ridge ends in a separate summit, Dodd. Dodd is actually the summit seen from Buttermere village, from where the true summit of Red Pike is hidden. If you don't fancy the final scramble up Red Pike then Dodd makes a satisfactory alternative, with better views of Buttermere. The most popular route is the tourist route from Buttermere. This climbs up a well made path through Burtness Wood and up the Bleaberry Tarn. This continues onto The Saddle, but fades away just when you really need it, at the start of the final climb. This is an easy scramble up an eroded slope that is never quite as difficult as it looks from a distance. This is the most direct route, and emerges right at the summit. The alternative route from Buttermere is longer, but avoids the scramble. Follow the path to Scale Force, then continue on along the path that runs to the left of the waterfall, above the ravine. This path eventually curves off to the left, reaches Lingcombe Edge and then follows the top of the edge all the way to the summit. From Ennerdale the main path leaves the forest road just to the east of the High Gillerthwaite Youth Hostel, climbing up a gap in the forest and then plodding up steep slopes to the summit. This isn't the most interesting of walks, but is at least close to the Hostel. Red Pike can also be reached along the ridge from Starling Dodd in the west or High Stile in the east. The eastern route is the most interesting, and a passage along the entire ridge line to High Crag is well worth the effort. The summit is a small rounded dome, with gentle slopes to the south and west, right above the top of the climb from The Saddle. The north-western boundary of the fell is formed by Scale Beck, which runs north from Little Dodd, over Scale Force then north-east into Crummock. 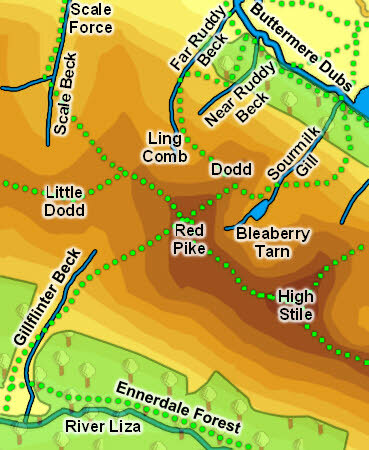 A series of becks are formed on the northern slopes, with Far Ruddy Beck and Near Ruddy Beck getting names. The north-eastern boundary is formed by Sourmill Gill, which runs north-east from Bleaberry Tarn and runs into the western tip of Buttermere. The fell thus gets a very short footing on the lake. Its northern border is formed by Buttermere Dubs, the stream linking Buttermere and Crummock Water. On the Ennerdale side there is no boundary with High Stile. Gillflinter Beck forms the south-western boundary, rising between Red Pike and Little Dodd and running south in the River Liza. The Liza forms the southern boundary. Red Pike shares Bleaberry Tarn with High Stile. This tarn sits in a dramatic bowl below Chapel Crags and the crags below High Stile, and is a great place to watch walkers struggle up the final climb on Red Pike. Scale Force, at the north-western corner of the fell, has the longest continuous drop on any waterfall on the Lake District. The fall is tucked away at the back of a deep rocky ravine, with easy access blocked by a rocky step, although it is just possible to get past this barrier and get close to the falls.